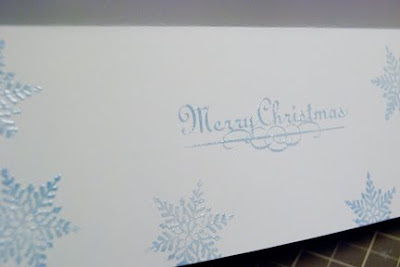 Design.Create.Inspire: Finally a Christmas Card! Knowing I haven't started my Christmas cards has been stressing me out! So I sat down made a 'prototype'. Beautiful card! Sure hope you start feeling better! Christmas is almost here we need you healthy and happy! Oh, that's so pretty! 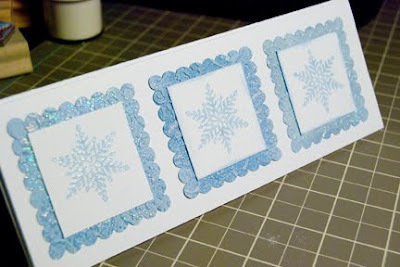 Love the soft blue snowflakes! Wow that card is gorgeous. Oh Magoooooo, you make such beautiful stuff. Sorry you're down with the bug. May I humbly suggest ginger tea, garlic toast and cayenne pepper tea with a twist of lemon? I know it doesnt sound too yummy but it works. what size is the card? it is really beautiful--yet again you impress! This card has such an elegant look!! So soft and wintery. Love it! beautiful card ,i would love the file.